the concept looks very nice, but you're underestimating the width of the river in that spot. It has nearly the width of an entire exterior cell, I think (roughly 100 meters). So a bridge cannot be built very easily. It would be helpful, if you had a better idea of the landscape first before posting location concepts. They look like good ideas most of time, but don't quite fit into the place you want them in. That's partly my fault as well, as I put a bridge in the map. I did know the width of the river though, and I think we discussed some sort of ferry service between the two roads. 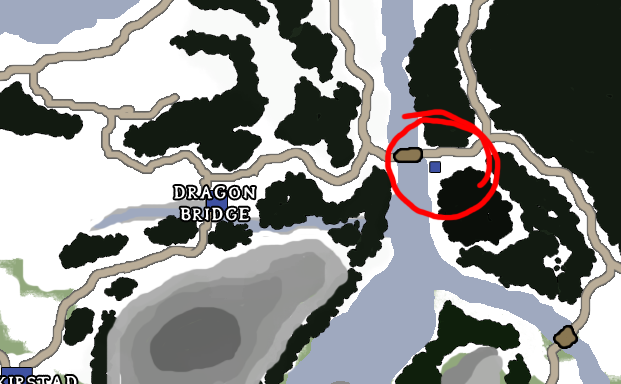 It's also possible we might use that location for Dragon Bridge, since -at least my opinion- it makes more sense to create a bridge-themed town to fit an existing river than it is to create a river to fit said town (the river Dragon Bridge is situated next to on that map doesn't exist in the current file). 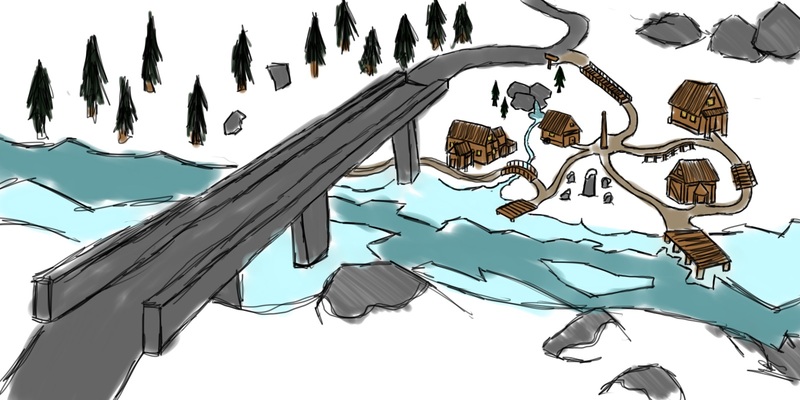 Also, it would look more impressive spanning the larger river, kind of like a mix between Lake Town from The Hobbit and Almas Thirr from Tamriel Rebuilt. We discussed that in IRC last week I think. A large bridge made of barrow pieces, on the mouth of the Karth. And a log cabin village on one of the sides. Okay. My picture is very sketchy. Just painted village located on a hill. It is built along the slope. Perhaps there are several sources and streams from the top, which flow into the river. Along the coast a little flat terrain, where there are several jetties and a tavern. There may not be a bridge at all. The road can go from the south. May be some tiny islands in river.